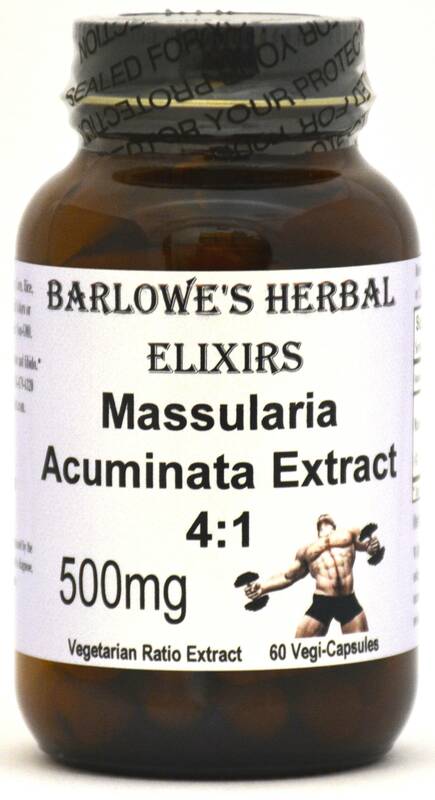 Barlowe's Herbal Elixirs now brings you high quality Massularia Acuminata 4:1 Stem Extract from a trusted source. For centuries, natives in W. Africa have utilized Massularia for the alleged boost in male virility that it provides. Bottled in Glass! No Stearates! No Fillers! No Junk! Barlowe's Herbal Elixirs now brings you the highest quality Massularia Acuminata 4:1 Stem Extract available from a trusted source. For centuries, natives in W. Africa have traditionally utilized Massularia for the alleged boost in male virility it provides. Studies have indicated that Massularia Acuminata may raise testosterone levels by approximately 40%. 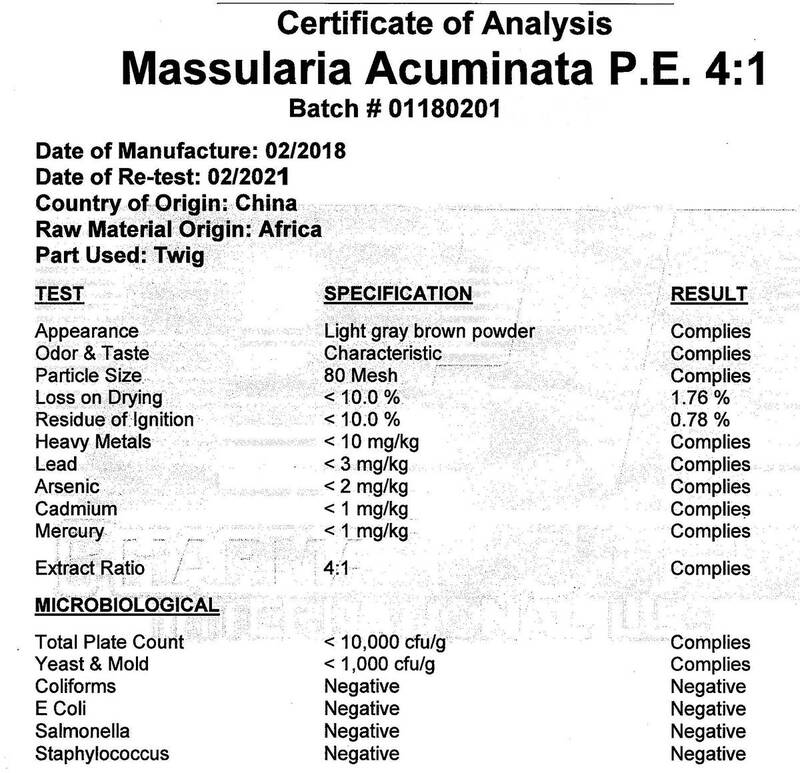 The Massularia Acuminata Certificate of Analysis (COA) for this particular batch is shown above. Bottled in Glass! No Stearates! No Fillers! No Junk! The use of medicinal plants in the management of several ailments is gaining popularity nowadays. Massularia acuminata, one of such plants is commonly used as chewing sticks due to its antimicrobial activity and the aqueous extract of its stem as an aphrodisiac. Aphrodisiac activity in some plants may be due to androgen increasing property of its phytochemicals. This study therefore sought to assess the androgenic potentials of aqueous extract of Massularia acuminata stem in male rats for 21 days. Male rats weighing between 220 and 260 g were completely randomized into four groups: A, B, C and D. Group A, the control received orally 1 ml of distilled water (the vehicle) while groups B, C and D were orally administered with 1 ml each corresponding to 250, 500 and 1000 mg/kg body weight of the plant extract, respectively for 21 days. Rats were sacrificed 24 h after 1, 7 and 21 days. Compared with the control, extract administration at all the doses produced significant increase (P < 0.05) in testes–body weight ratio, testicular protein, glycogen, sialic acid, testosterone, luteinizing and follicle stimulating hormone concentrations throughout the period of administration. Testicular gamma glutamyl transferase activities were decreased significantly (P < 0.05) after the first dose and was sustained throughout the experimental period. The available evidence in this study suggests that aqueous extract of Massularia acuminata stem has androgenic potential which may stimulate male sexual maturation and enhance normal testicular function. 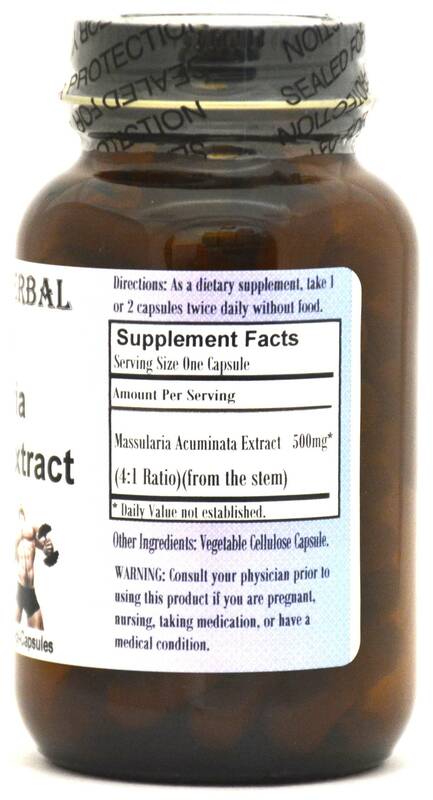 Caution: Barlowe's Massularia Acuminata Extract is generally safe, but it is potent and should be utilized with care. This product is for dietary use. If side-effects occur, discontinue use immediately! The above statements have not been evaluated by the Food and Drug Administration (FDA). This product is not intended to diagnose, treat, cure, or prevent any disease. Directions For Use: Take three or more capsules daily on empty stomach. Cycle usage - for instance take for two weeks and take one week off, or take for five days and take two days off. Results and usage amounts may vary based on body type and weight.